Jan. 29, 2008 -- The lobbies of buildings are normally spaces through which people pass to get where they are going. In the Laboratory Sciences Center, East Wing at ASU, the lobby is a destination unto itself. On Monday, February 11, a new science exhibit, encompassing features ranging from a porpoise skeleton to a meteorological station, will be inaugurated in the Laboratory Sciences Center, East Wing. Dr. Dan Howard, Vice Chancellor for Academic Affairs & Research, will officially open this display that showcases some of the ongoing scientific research and educational opportunities at Arkansas State. 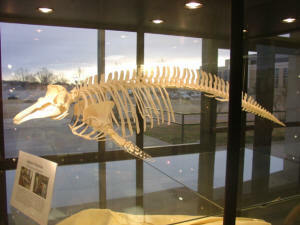 Among the unique features of this exhibit is the skeleton of a porpoise that was stranded off the coast of Massachusetts and was subsequently dissected and studied by ASU students. The exhibit also includes the cast of the skull of a minke whale, and a marine aquarium with some 50 species of fish, corals and other invertebrates aimed at explaining the new marine science program that is under preparation. A vivarium is also on display, containing some live individual specimens of basiliscus, the “Jesus Christ lizard,” so named because of its capabilities in walking on the surface of water, and blind cave fishes. All these live animals were bred in captivity to avoid any collecting and removing them from their natural environments. Other features on exhibition include current research on subjects as varied as the ivory-billed woodpecker, flying squirrels, effects of nicotine on the brain, and mine salamanders. Of special interest is an exhibit on the recent documentary filmed by the BBC’s Sir David Attenborough. This nature documentary, "Life in Cold Blood," contains footage filmed in Arkansas, dealing with research conducted by ASU's Dr. Stan Trauth, professor of zoology. A complete specimen of the American alligator, “Big Arkie,” is also being exhibited. Some exhibited material will also be available online. The data output from a local seismograph and meteorological station will be displayed on monitors in the lobby, as well as being fed to an online server for public access and study. This data will also be used by researchers who are studying the New Madrid Fault Zone and by students in climatology classes. A major part of the exhibit is a selection of rocks and minerals from the Karl Estes Mineral Collection. This massive collection was donated to ASU last year by Estes's daughter, Brooke Estes, and includes minerals that Karl Estes had collected from all over the world. On a regular basis, minerals fitting a particular theme will rotate into the display cases to show the rich diversity of specimens that can be found in nature. In future, other additional features will include a DNA statue at the entrance of the building and a prairie garden with native plants from Arkansas. The opening of ASU's "Hall of Science" on Monday will be the first event of a week-long celebration. The "Week of Science” at ASU will include the showing of science-related movies, the celebration of the birthdays of Galileo Galilei and Charles Darwin, and the release of high-altitude atmospheric probes. This exhibit, a joint project of the Department of Biological Sciences and the Department of Chemistry and Physics, has been almost an entire year in preparation. At the cost of nearly $50,000, this science exhibit has been fully funded by private donations and funds generated by the university’s research activities. For more information, including a schedule of exhibitions, contact the ASU Dept. of Biological Sciences at biology@astate.edu or (870) 972-3082.